And what a meet that was! Anoop and Karthik started their day getting printouts of the guest list and sorting out the seating at the venue (Microsoft office) while myself and Anwin went for the Google SearchMaster Conference. We met quite a few IndiBlogger members who followed us to the meet leaving Google behind (thanks guys!). Our highlight of the morning was meeting Amit Agarwal of labnol fame who unfortunately could not make it to the meet as he had a flight to catch. Come 2:30PM and we had our first few bloggers turning up already – Geo was there from the beginning till the end, and there was a point where people thought he was a part of our team! The meet kick-started with Anoop giving a quick run through on IndiBlogger, our long term association with Microsoft and our future plans, and a look at the agenda that was to follow. The “1 minute of fame” was great fun as usual – what with food-loving bloggers, SEO specialists, technology bloggers, Indic bloggers, Microsoft enthusiasts, Bollywood enthusiasts and blogs yet to be discovered by man. (We’ll explain that bit offline) Not only did we laugh at ourselves, our blogs and our blog posts – we also applauded them. Every one of the bloggers who arrived had a bit of blogging spirit in them, aside from a great sense of humour! We at IndiBlogger believe that there’s an entrepreneur in every blogger, and a blogger in every entrepreneur. (Yes, we do sound corny at times.) Girish, one of the spearheads of Microsoft BizSpark (who is fun to be with, as per his LinkedIn profile!) gave a brief and inspiring session on how Microsoft fosters the entrepreneur movement in India. 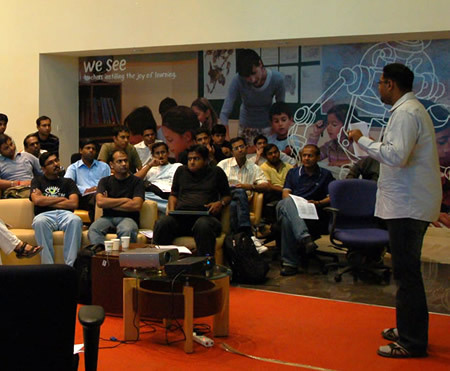 Prior to the official launch of Microsoft BizSpark in India, the IndiBlogger team had the privilege of attending a special session where we learned that this programme provides start-ups with free software and no strings attached. Along came the highlight of the evening, the blogger discussion on blogging rights. The IndiBlogger team unanimously agrees that we could not have picked anyone better than Sandil from Mutiny.in to moderate this session on blogging rights. He really knows his stuff, both from a community perspective as well as legal one. Sandil, a big thank you from IndiBlogger , and congratulations on your wedding. I’m sure you made your wife proud! In this discussion, the bloggers had a lot of relevant questions to ask and pretty soon we had members of the press joining in the discussion as well. One of the conclusions arrived at was that we need an umbrella organization to represent and defend Indian bloggers. If anyone out there decides to start this up, you have our support. Next came the “How well do you know your readers?” from the IndiBlogger team, and apparently we didn’t know our bloggers too well… so let’s move on, shall we? We must confess that we are writing this post on a Windows Vista machine and we’re looking forward to getting our hands on a copy of Windows 7. Some of the stuff shown to us were truly refreshing, especially the option of arranging window panes on your desktop with mouse gestures. Vic and Vijay, both Technology Evangelists displayed their prowess in Windows 7 with aplomb. Vic, we’re sorry we had to cut your session short, but the pizzas were getting cold! We do not know if this was because of the recession, but the pizzas were demolished in no time at all. After a long and loud chit chat amongst the bloggers everyone soon settled down in their seats in anticipation of the IndiBlogger forum – an open, free for all discussion on everything about blogging. As Deep Purple once said, “This may seem like a devilish ploy but it’s one way to bring the proceedings to an end”. The offline forum turned out to be as good as the one we have online. We were bombarded by a barrage of “key words” like deep linking, adwords, adsense, overture, domain registration, nameservers, problogger.net, mind mapping, widget bucks, Tyroo, hostgator, bluehost, dreamhost and every other host. A good part of this was led by a self proclaimed Malayalee who gets 4-5 cheques from Google every month via adsense. Dude, not only are you sly enough to figure out how to make money online but you’re also pretty funny! Sriharsha, it was great to finally meet you. In fact we’ve spoken so much on the forum that it felt like we knew you for years! Aarif spent a few minutes demonstrating the freeware PMW (Process Manager for Windows) he has developed. His only lament is that most of the people who had downloaded his freeware are from outside India! You’ll find links to what other bloggers have had to say about this meet on the official Bangalore IndiBlogger Meet 2009 page. The pictures of the meet are up on Flickr. A big thank goes out to Microsoft who sponsored this event. 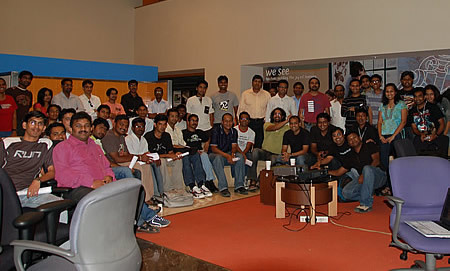 More importantly, a heartfelt thank you to all the Bangalore bloggers who reaffirmed our faith in the Indian blogger community, and gave us a great start to the IndiBlogger road show 2009. All you bloggers from the rest of the country, we’ve heard your requests and rest assured, we’ll be there soon! Chennai Blogger Meet – 80+ bloggers! Hey after reading this looks like I missed a lot. Unfortunately I had joined little late( from Windwos 7 session onwards). I personally thank the IndiBlogger Team Ashwin, Renie and Anoop… and others for giving us the opportunity to speak in their event, I had a gala time as you all are fun guys to hang out with. The crowd was great and I am very pleased with them, we had a mix batch of technical and nontechnical audience, this is the first time I was presenting to a nontechnical audience and I hope I tried to be as simple to understand as possible. Well I personally was not satisfied by my own demo , as we didn’t have enough time to demonstrate what I planned to. Still I managed to show couple of things in Win 7 (Ignoring constant reminders from Anoop)… well the Pizzas were getting cold and everyone was hungry as everyone came from 3PM, so not a problem, We will get a little better organized next time, while consuming the already cold pizzas I still managed to catch up with a group of bloggers showcasing them couple of more demos. Overall a great event I myself learned a lot from bloggers specially the Cheque , and you all inspired me to restart my website that I turned off because of time constraint, one week I will have my site up and thanks to you guys for inspiration will update you guys with the links then. It was great making new friends. Some asked me my Photography hobby URL so here u go. Thanks for your feedback. It was indeed a fantastic show. Lots of learning and loads of fun filled. Do lemme know, if you need more info on WIndows 7.. he heee..>!! !We wont bugging you again 😉 he hee…. Jokes apart, it was an excellent show. Keep it going. It was a really nice meet but unfortunately i was not able to stay for the meet after the Windows 7 session. Wanted to discuss more with other bloggers. Anyway, next time!! I enjoyed my time there.. It was nice to be at the event -it was good to see folks showing lots of interest…I wish to see more bloggers in the education segment..